the Rose Garden of the White House in Washington. 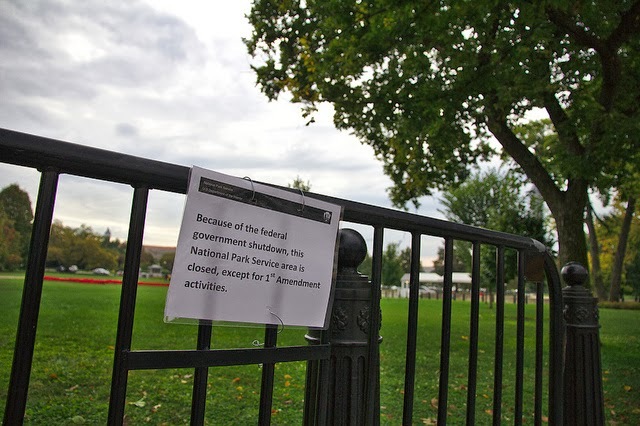 In U.S. politics, government shutdown occurs when U.S. Congress is unable to authorize funding for various government operations. Government stops all the services except few essential ones. About 800,000 out of 2.1 million federal employees have been sent home on an indefinite unpaid leave. Essential federal services that are working now includes armed forces, federal medical services, National Weather Service, etc. Why the US government shutdown occurred? The US budget year ends on September 30. The Democratic controlled Senate and the Republican controlled House of Representatives are considering bills to fund the government past the deadline. However, the Republicans are not agreeing to the funding for President Obama’s healthcare law. 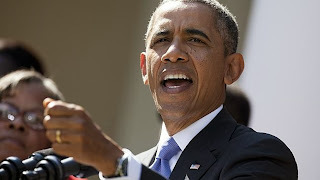 Republican controlled House of Representatives wants changes to the implementation of the Patient Protection and Affordable Care Act, whereas President Obama wants to sign into a law a budget proposal without those changes. How will it affect the US economy? Goldman Sachs estimates that a three-week shutdown would slow down the annual economy growth rate in the Oct-Dec quarter by up to 0.9-percentage point. 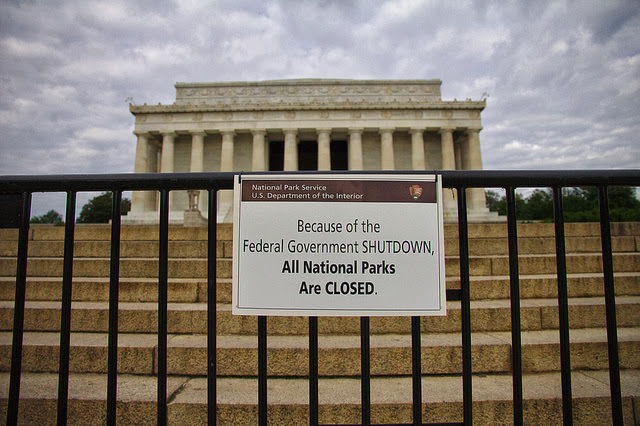 Moody’s Analytics estimated that a shutdown of three to four weeks would cost the economy about $55 billion. Lost wages of federal employees will amount to about $1 billion a week. How will it affect the world economy? Economists believe if the U.S government shutdown lasts long, then it will be more likely that the Federal Reserve will delay reducing its monetary stimulus program. This will boost emerging markets at the expense of the dollar. Most of the countries including India and Canada are not worried as the shutdown enters its second day. What worries the major economies is debt-ceiling negotiations and FOMC (Federal Open Market Committee) meet which is due later in the month of October. Most Asian markets, which generally react immediately after any event in US, have stayed stable since the government shutdown. Indian Sensex in fact rallied over 300 points in the early morning trade today (Thursday) led by IT, metal, autos and capital good stocks. Indian business executives told Voice of America that they could not understand how a developed country like the U.S. could shut down its government because of a legislative impasse. China, UK and Germany issued travel advisory for their citizen in the wake of government shutdown, saying that tourists might face inconvenience and delays. It is a bad start, but things may get even worse should the two sides (Republicans and Democrats) fail to agree on raising the $16.7 trillion debt ceilings by the 17th October deadline. What is Debt Ceiling? Why the U.S. and major economies are worried? Debt ceiling is like a self-imposed debt limit or borrowing cap implemented to keep monitoring the government spending. Since the government does not make enough through taxes to cover the costs, it needs to borrow money to pay all their bills. If politicians again fail to reach to an agreement, the government will be unable to borrow, leading to an immediate 32% cut to spending on services like social security, FBI, infrastructure development, weather, food stamps etc. In this case, Treasury will have to prioritize some payments and services over others. It will be a tough decision as government makes about 100 million payments each month. U.S. economy is the largest economy in the world responsible for 25% of the global economy. If all the analysis, worries and fears comes to be true, then it would change everything for the first time. The world might see another global financial crisis only because the two political sides did not agree with each other. BRICS, A Political Formation From an Economic Forum. Although the spotlight is on the trade war between the United States and China, one aspect that is currently ignored by the media is represented by signs of weakness in the European continent. After posting a -0.3% GDP contraction in the third quarter of 2018, the economic indicators released from Germany in 2019 cannot support a positive economic picture. The manufacturing sectors continue to show signs of weakening, with the Markit PMI Composite now at 51.6, down from 52.3. Industrial Production had been contraction by 1.9% in November, and both imports and exports had been down by 1.6% and 0.4%, respectively. DAX trading had also suggested there is growing concerns among investors and the main German stock index peaked out in July 2018, being now down by 15%. Germany relies mostly on exports, being the third exporter in the world, only surpassed by the United States and China. That is why the weakness we see in Germany is actually a symptom of what’s happening in other European countries as well. The new populist government in Italy, formed by La Lega and The Five Star Movement faced a serious challenge to get the EU’s approval for the 2019 budget, as the already high debt-to-GDP ratio (currently at 131.8%) raises concerns on whether the country will be able to meet its debt obligations in the future. There are also serious concerns about the banking sector, which despite mergers and acquisitions, and huge capital available from the ECB, were unable to solve their problems which emerged after the 2008 financial crisis. The future of Italy is very uncertain, and analysts predict that the new government will not be able to meet their economic promises, given that we are at the end of a business cycle. Speaking of France, the problems are social at the present time. President Macron was unable to stop the “Yellow Vests” protests, despite promises to increase the minimum wage and the overall standard of living for the very poor. France’s debt-to-GDP ratio currently stands at 97%, but given the latest promises, there are concerns whether the country will manage to keep the budget deficit below 3% in 2019, as the European treaties demand. Although there’s a single currency in Europe, in terms of fiscal policy things were very fragmented, which is why the economic recovery had been very slow and the reason why investors predict Europe will face the greatest challenges to solve its economic, political, and social problems. Sterling whipsawed on Thursday, first tumbling and then rallying, and experiencing robust volatility. The GBP/JPY also experienced a wild ride as the yen increased in value on safe-haven flows. Sterling has been trading under pressure following news that the European Union has no plans for further Brexit discussions. May is now stuck between a rock and a hard place and may have to exit from the EC without an agreement. The European Union announced through a spokesperson saying that they had no plan on further Brexit discussions with the UK. The British had hoped for additional assurances on the contested Irish backstop. Prime Minister May has been making the rounds with EU leaders ahead of this month’s vote in parliament, but her diplomacy appears to have failed to change any minds. The Financial Times reports that a EU source said no dialogue has occurred over the past 10-days and that PM May spoke to the EC head Donald Tusk on January 2. The EU is sticking to their word and appears to reflect the view that EU officials have gone as far as they can as it relates to the Irish backstop. They also revealed that if a backstop was triggered that EU negotiators would use “best endeavors” to negotiate a replacement agreement. Sterling was also shaken by a rebound in the dollar which was buoyed by an uptick in US yields. US yields tumbled on Wednesday as traders removed all the potential tightening of interest rates in 2019. In fact, the yield curve shows that 1-year yields are less than current yields. This came despite a stronger than expected private payroll report, released by ADP on January 3. ADP reported that Private payrolls rose by 271,000 in December, beating expectations that jobs would increase by 178,000. You can follow the private payroll report on Vestle news. The strong jobs numbers should help lift wages which is an argument for why the Fed should remain vigilant. The increase in private payrolls was the largest climb in nearly 2-years and increased the 2018-month average of private payroll gains to 203,000. The report showed the increase in jobs was mainly drive by professional and business services which increased by a solid 66,000 while education and health services contributed 61,000 and leisure and hospitality added 39,000. In all, service-related industries were responsible for 224,000 of the new hires, while goods producers rose by 47,000. This include an increase in construction which grew by 37,000 and manufacturing added 12,000. Natural resources and mining lost 2,000 positions. Sterling rebounded after making a fresh low of 1.24 which is a 20-month low on sterling versus the greenback. The exchange rate is likely to remain volatile until there is a solution to the UK exit from the EU. The trend is also downward sloping, and with momentum negative, the path of least resistance is for a lower exchange rate for sterling. German industrial power and quality levels became a national symbol in the latter part of the 20th century, and to some extent the lifeboat of post-war reconstruction. Even throughout the industrial rise of Asia at the end of the century, the German island remained sanctuarize from the competitive attacks of Eastern developing countries. But several German industries have been increasingly struggling in the past decade and gasping for air. Is Germany at the end of its prosperity cycle, for having rested on its laurels? Germany, along with its wartime Japanese ally, impressed the world with its rise from its ashes in the latter half of the 20th century. Starting with the Marshall plan quickly followed by self-standing growth, Germany speedily re-built its industrial capacity, and its reputation for top-notch quality. As soon as in the 1960s, German brands invaded the global market with their sturdy reputation preceding them: if the product said “Made in Germany” then the customer could feel sure there was nothing better on the market. At the end of the century, a large share of the top global engineering segment was German: BMW, Bosch, Rheinmetall, Merck, the list is endless. Economic historian Werner Abelshauer describes  how the label “made in Germany” became a symbol of quality: “The label “Made in Germany” ultimately developed into a sign of quality, though it took a while.” But the era during which Germany levitated above the rest of the industrial world is coming to an end. While Germany remained unharmed by Asian competition for longer than its neighbors, it is now fighting on a level field with all other manufacturers in the field, and worse: it’s not doing all that well. Economic reporter Chris Papadopoullos placed  the start of the decline during the year 2015: “Total production, which includes construction, manufacturing and mining, dipped 1.2 per cent in August compared with July, German statistical office Destatis said. The production of capital goods fell 2.1 per cent while consumer goods dipped 0.4 per cent. Construction and energy output also posted declines “. Of course, the Volkswagen scandal caused a major dent in the image of industrial Germany. Consulting group ALVA published an extensive study of the post-scandal consequences on the image of Volkswagen and German quality altogether, and wrote : “After the emissions scandal revelations, we can see a very different picture, with all Advocacy drivers having moved into negative territory to a greater or lesser extent. This is indicative of a reverse halo effect in which a negative emotional response to a company due to an erosion of trust spills over and clouds rational judgement of all of its traits.” Until then, German car manufacturers had been above suspicion, thanks to their reputation for industrial quality and business performance: when one is the best, there is no need to cheat. Through the fraudulent emissions revelations, Volkswagen, one of Germany’s flagships, showed that “Made in Germany” wasn’t all it was cracked up to be, and that they had flown too high on borrowed wings. The scandal shed doubt over other German flagships in its wake, as reported  by automotive journalist James Mills: “German media allege that US authorities have discovered that Daimler, parent of Mercedes, developed software for its diesel-powered vehicles that would shut down vital emissions equipment after driving just a short distance. Daimler is reported to have come up with programs that would shut down certain functions of the selective catalytic reduction filter after just 16g/km of NOx is admitted.” And the damage extended beyond the automobile world, into the whole industry. Of course, if the problem were limited to the automobile world, Germany could survive on the others. But the slipping in industrial standards, the resulting loss of performance, and finally the need to resort to unsavory business practices to survive, seems to have contaminated all fields of the German industrial apparatus. German shipbuilder TKMS recently illustrated the downfall: after decades of occupying high grounds on the submarine market, the engineering firm is facing such a severe string of problems that it is facing being sold off entirely and scrapped from the national heritage. After losing a major submarine contract in Australia, it delivered a few corvettes to the German Navy, which simply refused them on the dock, due to quality standards being overstepped. Wall Street Journal William Wilkes reported : “Germany’s naval brass in 2005 dreamed up a warship that could ferry marines into combat anywhere in the world, go up against enemy ships and stay away from home ports for two years with a crew half the size of its predecessor’s. First delivered for sea trials in 2016 after a series of delays, the 7,000-ton Baden-Württemberg F125 frigate was determined last month to have an unexpected design flaw: It doesn’t really work.” Germany’s submarine fleet, also built by the same shipbuilder, is currently completely out of order . In desperate need for new contracts, it resorted to bribing officials, resulting in a political and economic quagmire in Israel. In an attempt to secure a submarine purchasing contract in Tel-Aviv, TKMS allegedly transferred over 10 million dollars through shell companies to a top government Israeli official. News Site Haaretz  reports: “At least ten high-powered individuals have been identified as involved in the scandal, including very close associates of Prime Minister Benjamin Netanyahu. A multimillion dollar submarine deal with German shipbuilder ThyssenKrupp is the focus of a police investigation, which is probing possible wrongdoing involving Netanyahu’s personal lawyer and German shipbuilder ThyssenKrupp’s local representative.” For weathered investors, this time in which German manufacturers need to resort to cheating to make up for their slipping industrial standards is something completely new, and in some ways an earthquake. As a result, investments are scarce for start-ups , as well as for established businesses . Germany’s downfall in the industrial world isn’t taken lightly by political forces, and the economic problem is turning into a political one, with worker unions stepping up their criticism of management, and politicians scrambling to stop the nosedive. Angela Merkel has been urgently addressing the problem, but so far too little or no avail. “Angela Merkel champions Industry 4.0, urging investment in new technology. German business isn’t heeding the call”, says Politico . Unlike Angela Merkel, many in the country haven’t figured out that Germany had slipped from one industrial model to another: initially known for the superb quality of its products, it was caught up quickly by its direct competitors: United Kingdom, France, Japan and the United States in particular. The core of German’s added value today lies mainly in the machine-tools and high-tech subsystems of German equipment-makers. But as a whole, Germany no longer has the capacity to integrate large and complex systems such as aircrafts, frigates or new-generation submarines.